CooDo is a concept developed by the founder of LTG (Lofts to Go) Mark Dare Schmiedel, as a means to experience nature at close quarters. 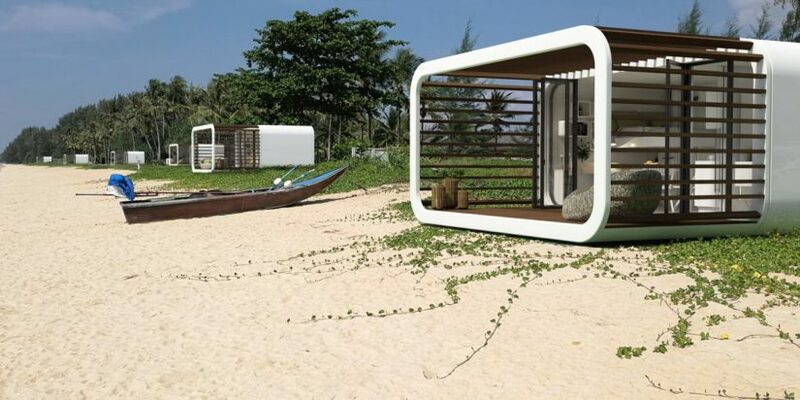 CooDo uses a modular design to create a modern space for mobile living. It can be transported and installed easily and efficiently in most places. The modular house design is nothing new. Sears came up with the idea in the 60s, and you will still see houses in America with Sear’s modular design. A modular design allows manufacturers to build with efficiency and create less waste. CooDo echoes what Sears created decades ago, and it has a few upgrades. It has an installed smart home system which let you control everything in the house from the smartphone. The modular design by the CooDo lets you make changes to the structure and connect additional units when the owner wants to expand. Because of the mobility of the CooDo, its installation is quick, economical and easy with almost no impact on the building site. Coodo can be used as a home, an office space, a conference room, a store, a café, a lounge area. However, in terms of moving the house, it probably won’t be as easy as CooDo made it out to be. There are issues with utility lines, plumbing that take a whole crew to resolve. If you live somewhere with a lot of natural disasters, it is unclear how well it will perform when a hurricane hits. Until we see these homes on the street, the product is still yet to be tested by time.